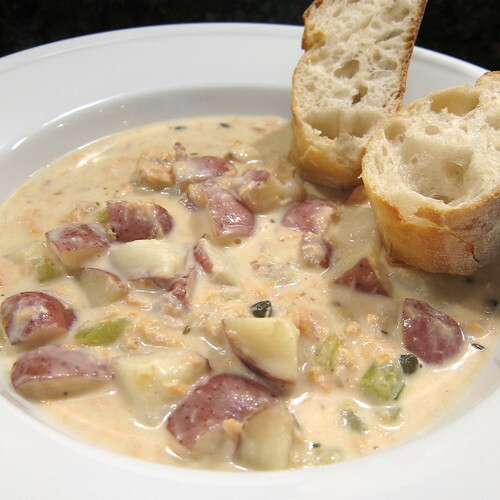 When we were in Seattle this summer we had a fabulous smoked salmon chowder for lunch one day at Pike Place Market. It had capers in it which seemed unusual but really added a great salty tang. Now that soup weather has hit here in MN we decided to take a stab at making it ourselves. Really the recipe is a pretty basic chowder recipe yet, the smokey flavor of the salmon & with the capers takes it to another level. It's not too heavy a chowder but, it has a real richness. This is a soup that comes together in 30 - 40 minutes making it a quick, satisfying lunch or dinner. I was going to buy smoked salmon to make this soup but since we have so much Alaskan salmon in the freezer we decided to try smoking our own. Instead of pulling out the smoker we used one of the smoker bags we had left from out apartment days. These bags turn your oven or grill into a smoker for about a pound of meat, fish or vegetables at a time. We've found they really do give the food a great smokey flavor (& your house will smell like an amazing bbg too). All I did to smoke the salmon was put a filet that in the bag, seal it up & put it in a 350 F preheated oven for 1 hour. The salmon came out fully cooked, flakey, moist & smokey. I didn't season it at all but it would be fun to experiment with putting sauces like teriyaki or maple on before smoking. This isn't exactly like the smoked salmon you buy in stores, which is most likely cold smoked, but its perfect for recipes like this. We plan on trying it again to use in pasta or a lentil salad. Put the potatoes, celery, onion & chicken stock in a large soup pot. Bring to a boil. Cover & reduce heat to low. Let simmer for 15 minutes until the potatoes are tender. Sprinkle in the flour and stir until combined. Add the salmon, half & half, capers, thyme, thyme, salt, a few grinds of fresh pepper & a couple of dashes of hot sauce. Stir to combine. Let simmer for about 10 minutes. Taste & adjust seasoning as needed. Serve with crusty bread & extra hot sauce if desired. Great take on a chowder and you left the salmon all by itself...no other seafood. Salmon is a solo act. 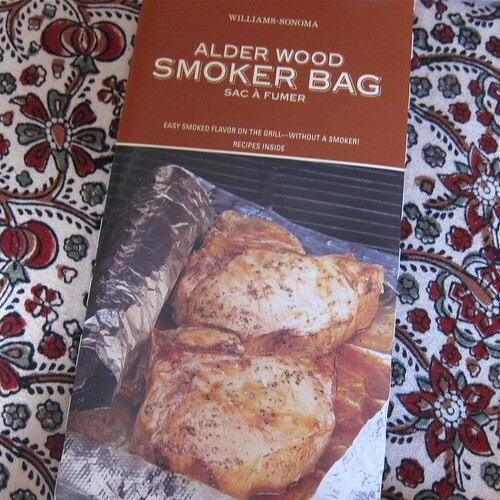 I want to try this - especially smoking the salmon! That is cool. I had not seen those pouches before. A great idea. I smoked half a trout today - I will definitely give this chowder a go using that! The capers sound like a great addition. I could go for a bowl of this tonight! It is so cool around here, but I love it because it is perfect for chowder and soup. Those bags are really interesting. I bet they do make the house smell great!